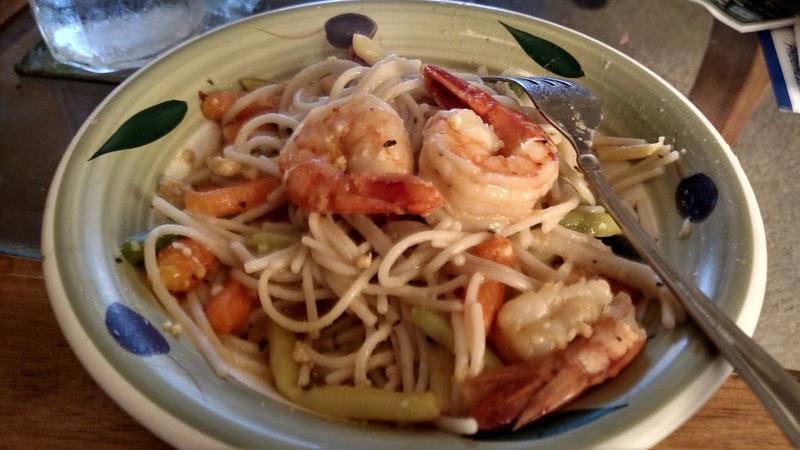 Is shrimp scampi as popular as it once was? I'm not sure. Used to be it as on every Italian restaurant menu. Well I thought it would try my ha d at a dairy free version. I am quite pleased with the results... It was easy and fast. And so tasty. 1/2 pound gluten free brown rice pasta. 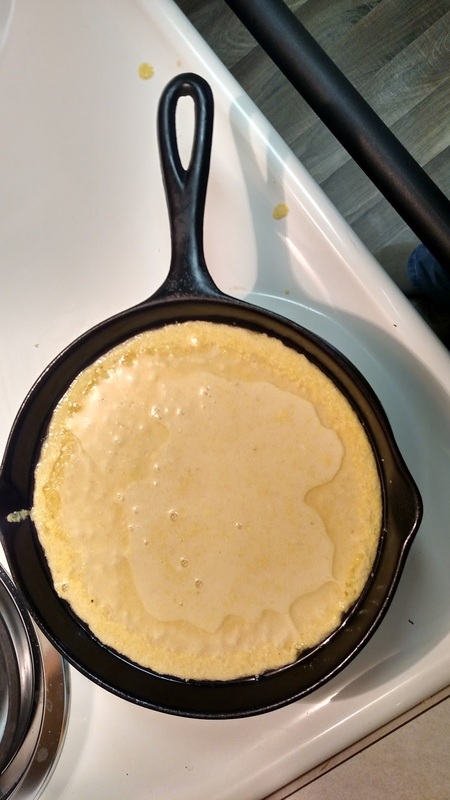 Start by adding olive oil to a large skillet on medium heat. Add the garlic, red pepper, and herbs. Cook for 5 minutes. Add the broth and vinegar. Simmer until it reduces a little. Turn down to low heat. In a large stock pit add water and a little salt. Let it come to a rolling boil. Add the pasta. Bring down the heat, stir the pasta so it doesn't stick together. Turn down the heat to low, cover and let it cook for 8 or 9 minutes, or whatever the package directions are. 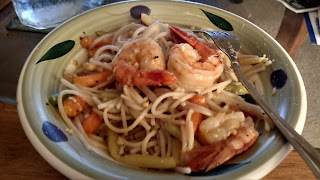 While the pasta cooks, add the shrimp to the sauce. Cover and let it. When the pasta is done, drain and add to the shrimp and sauce. 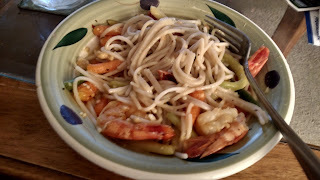 A note of caution, since this called for precooked shrimp, don't let it over cook. They tend to get rubbery. This cake is sweet and moist. My version is gluten free and dairy free. 1 Heat oven to 325°F. Spray bottom and sides of 8- or 9-inch square pan with cooking spray. 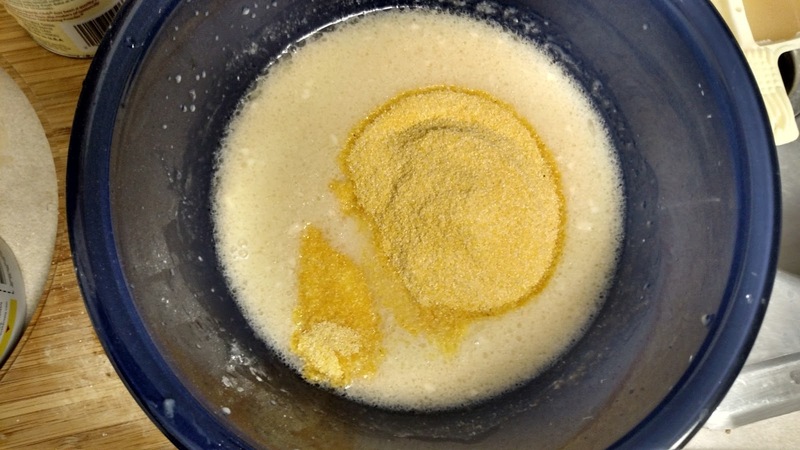 2 In 1-quart saucepan, melt 1/4 cup margarine over medium heat, stirring occasionally. Stir in brown sugar. Heat to boiling; remove from heat. Stir in 1/2 teaspoon cinnamon. 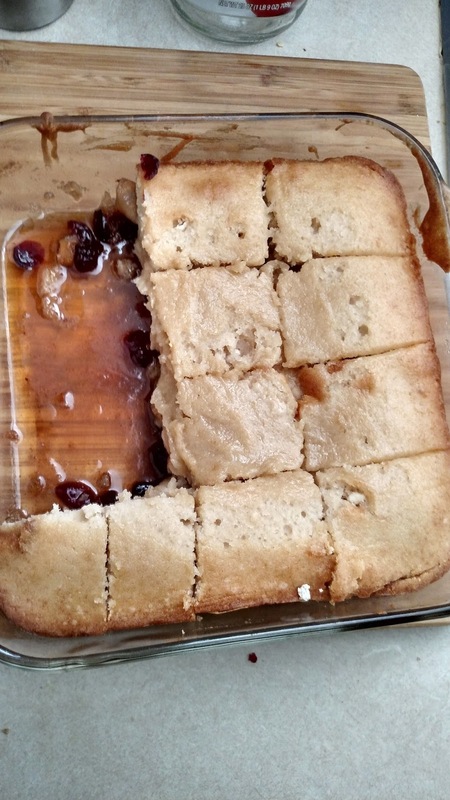 Pour into pan; spread evenly. 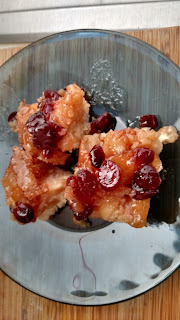 Arrange apple wedges over brown sugar mixture, overlapping tightly. 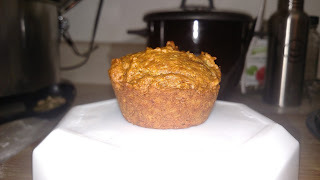 3 In medium bowl, mix flour, baking powder, 1/2 teaspoon cinnamon and the salt; set aside. In large bowl, beat 1 cup granulated sugar and 1/2 cup vegetable oil with electric mixer on medium speed, scraping bowl occasionally, until fluffy. 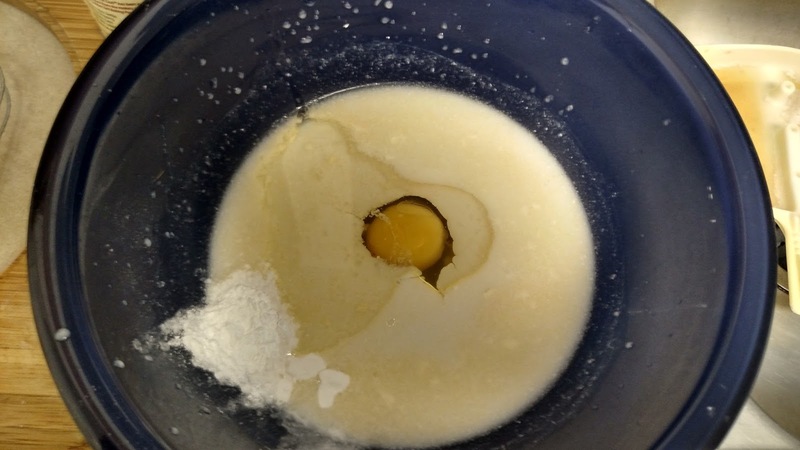 Beat in eggs, one at a time, until smooth. Add vanilla. Gradually beat in flour mixture alternately with almond milk, beating after each addition until smooth. 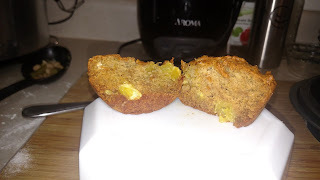 Spread batter over apple wedges in brown sugar mixture. 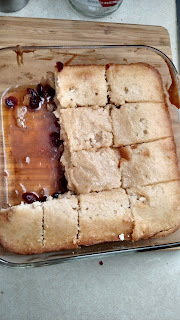 4 Bake 55 to 65 minutes or until toothpick inserted in center comes out clean. Cool on cooling rack 15 minutes. Meanwhile, in medium bowl, beat coconut cream on high speed until it begins to thicken. 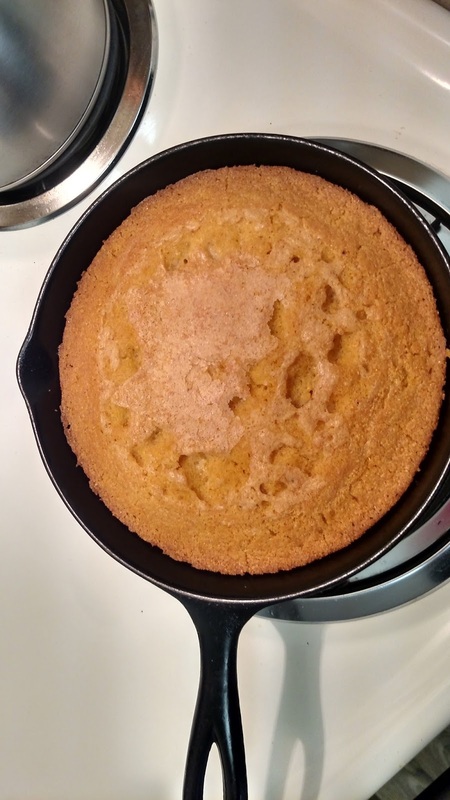 Gradually add 2 tablespoons powdered sugar, beating until soft peaks form. 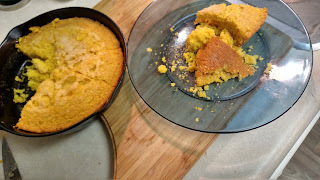 5 Run knife around sides of pan to loosen cake. Place heatproof serving plate upside down over pan; turn plate and pan over. Remove pan. Serve warm cake with whipped cream. Store cake loosely covered. Elimination diet can be a pain, but sometimes they help get to the root of your symptoms. The first elimination diet I did was back in 1989. My doctor gave my a book. The name escapes me. It was written more for children, by it was quite helpful. He thought my constant runny nose and frequent nausea may be caused by something I was eating. Brilliant. So for a week I substituted this for that. Sweet potatoes for bread. Cut out milk; nibbled on nuts, and at the end of the week, my symptoms had improved. Also I list 5 pounds. The problem was at that time the diet could not be maintained; I was not in charge of the household grocery shopping. As I got older my symptoms got worse, and I was getting heavier. So more dieting. Along came an interesting plan that basically cut everything except the basics. I took drops of amino acids and herbs three times a day and ate vegetables, lean meats and fruit twice a day. Fir the first time in years I list weight. My runny nose and soar gut were gone! As I started adding back certain foods the symptoms returned, and were worse then ever. Then the "first storm" (see my earlier post). I went back to the elimination diet, and basically affirmed my beliefs. Since then a whole new world of ideas has opened up. It had been an interesting adventure discovering new stores, new information new ingredients. So how do you do an elimination diet? Start making small changes to each meal and snack. If you suspect milk is an issue for you, then cut it out, or try a nut milk, like almond, cashew, coconut. The thing with food sensitivities, is they may not show up in a scratch test at the doctor's office. But you know how you feel. So try an elimination diet. See if you don't feel better. One of the best books I have read is The Virgin Diet by JJ Virgin. She makes it very simple and has some great recipes in it. 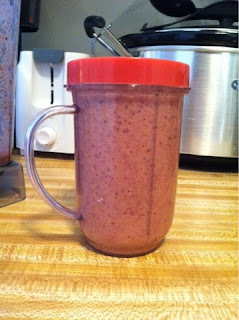 there is nothing like a cool creamy smoothie first thing in the morning. This is my new favorite. 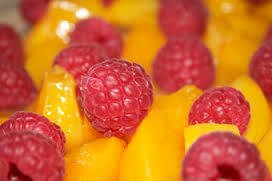 I like to use frozen fruit, that way no need to add extra ice to make it thick. Add all ingredients to a blender like a Vita Mix, blend on high for 5 minutes. Serve. My taste bubs were absolutely delighted Friday evening. We discovered All Slabbed Up in Leavenworth Kansas. The place doesn't look like much. 60's style Diner seating mixed with high tip tables and chairs that seem to be in need of painting. The are miniature dollar bills pinned to the walls. Also there is a medium sized deck for outdoor dining. 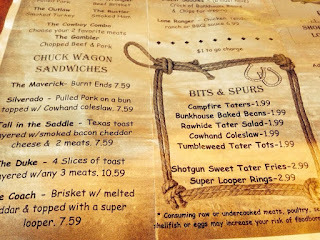 The menu is simple with country and Western sounding names like The Duke, Silverado, campfire taters and tumble weed tater tots. The menu has the usual, sandwiches, ribs, brisket and the famous KS burnt ends. The serve soft drinks and Boulevard Ale.. it's a local favorite, brewed in KC. We had the Silverado with campfire taters. What came out was a plastic basket full of French fries with grilled onions and a pulled pork sandwich topped with not creamy Cole slaw and a bun the barely covered a full third pound of meat and cabbage. The last time I had something this good my uncle had smoked the pork and seasoned it with his "secret" sauce. I think bourbon in involved. First bite and I was in love. The pork was smoked, tender and just a little tangy The Cole slaw was still crisp. There was two sauces. One was mild not too sweet, and the other had a kick. But be prepared the heat sneaks up on you, so have your drink close by. Just a note on bar be que sauce, sometimes Kansas City style sauce can get too sweet depending how much brown sugar or molasses is added. So all in all they get a 10. I will be back. Next time maybe we'll get the Duke. I am finding it interesting just how much of something I can eat before feeling ill. Just a small amount butter, and my nose runs. I woke this morning a little itchy and my nose running-- back to the Benadryl. Of course I'm not sure if wasn't the potato that caused my issue. Potatoes are in the nightshade family, and do cause trouble for some people. . So still trying to figure it out. 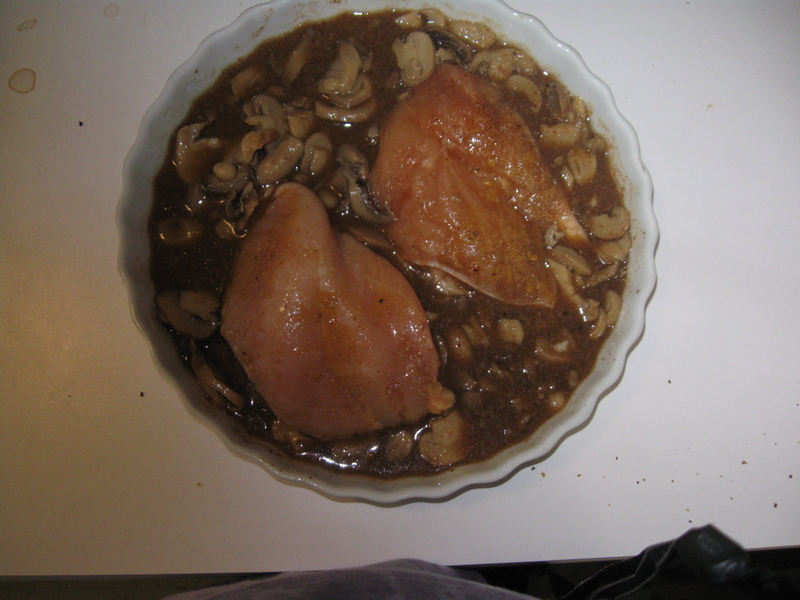 Here's a new recipe for Lemon Chicken. Yum. In a large skillet heat to medium heat, add the olive oil. Add the chicken and salt and pepper. In five minutes turn over, add the garlic and lemon juice. Cook another three minutes add the capers. Finish cooking until done, a other 3 minutes. Two weeks ago i hit one of those road blocks. I had such a firestorm of histamine running through me. I couldn't sleep. I could barely work. 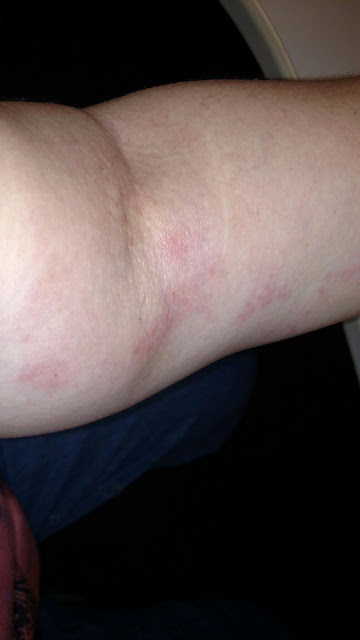 This is a picture of my arm broken out with hives. As I notices eating certain foods made my symptoms worse, chocolate, eggs, dairy, and some wheat products like bread and pasta. the worst was eating these in combination, like egg and cheese sandwiches. So a decision had to be made. If I want vibrant health, then it need to give them up. Of course this from the girl who ate ham and cheese omlettes and chocolate chip cookies by the handful in my youth. 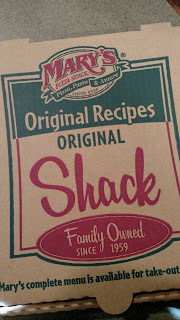 I have some great food memories. Big fear not, all is not lost, because I refuse to act like a victim in this. I have chosen to trat this new phase like a grand adventure. Exploring new options and menus. Another interesting observation is that my joints don't hurt as much and I'm starting to sleep better. So there it is a née direction, a new adventure in eating. I will be using this space to chronicle this adventure. Who knows maybe my insights mig help someone else. At any rate, today I roar like the tiger I am, because I am proud to be me. Easy delicious, vegetable side dish. Great with soft tacos. yum! 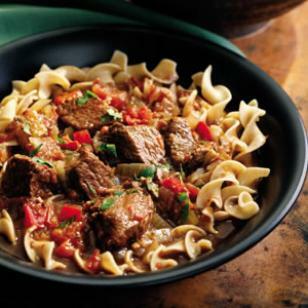 This streamlined goulash skips the step of browning the beef, and instead coats it in a spice crust to give it a rich mahogany hue. This saucy dish is a natural served over whole-wheat egg noodles. Or, for something different, try prepared potato gnocchi or spaetzle. Place beef in a 4-quart or larger slow cooker. Crush caraway seeds with the bottom of a saucepan. Transfer to a small bowl and stir in paprika, salt and pepper. Sprinkle the beef with the spice mixture and toss to coat well. Top with onion and bell pepper. Combine tomatoes, broth, Worcestershire sauce and garlic in a medium saucepan; bring to a simmer. Pour over the beef and vegetables. Place bay leaves on top. Cover and cook until the beef is very tender, 4 to 4 1/2 hours on high or 7 to 7 1/2 hours on low. Discard the bay leaves; skim or blot any visible fat from the surface of the stew. Add the cornstarch mixture to the stew and cook on high, stirring 2 or 3 times, until slightly thickened, 10 to 15 minutes. Serve sprinkled with parsley. 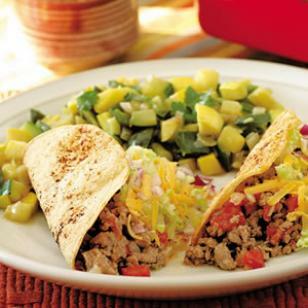 Make Ahead Tip: Cover and refrigerate for up to 2 days or freeze for up to 4 months. | Prep ahead: Trim beef and coat with spice mixture. Prepare vegetables. Combine tomatoes, broth, Worcestershire sauce and garlic. Refrigerate in separate covered containers for up to 1 day. Ingredient Note: Paprika specifically labeled as “Hungarian” is worth seeking out for this dish because it delivers a fuller, richer flavor than regular or Spanish paprika. Find it at specialty-foods store or online at HungarianDeli.com and penzeys.com. Per serving: 180 calories; 5 g fat (2 g sat, 2 g mono); 48 mg cholesterol; 6 g carbohydrates; 0 g added sugars; 25 g protein; 1 g fiber; 250 mg sodium; 298 mg potassium. Nutrition Bonus: Zinc (40% daily value), Vitamin C (35% dv), Vitamin A (25% dv), Iron (15% dv).